Shortness of breath — it is always a symptom of the disease. 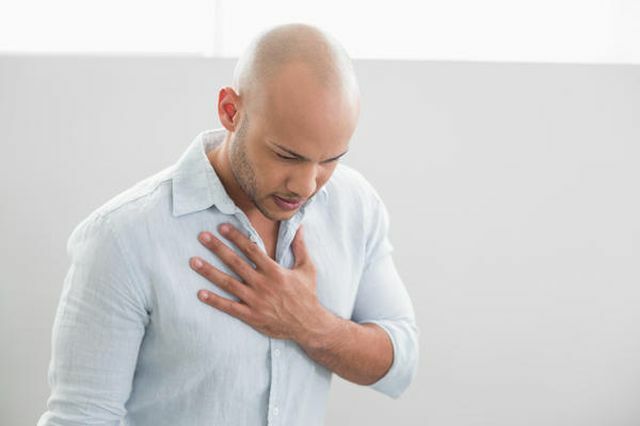 However, the shortness of breath should be distinguished from the noisy breathing with a strong nervous disorder or hysteria (in the latter case, the noisy breathing is interrupted by deep sighs). Apnea is a disorder of breathing, increase its frequency and / or depth, which are often accompanied by a feeling of lack of air (dyspnea), and sometimes fear, fear. By an effort to stop it is impossible. The reasons for the appearance of shortness of breath are a lot. The procedure and the type of assistance will vary depending on whether an acute (sudden) whether it choking or shortness of breath increases gradually and is chronic. The most frequent causes of the acute attack of shortness of breath, choking. Heart failure — «cardiac asthma». The sharp rise in blood sugar and acetone in diabetes. Spasm of the larynx with allergies or severe inflammation. Foreign body in the airway. Strong inflammatory and infectious diseases with a high temperature (solid pneumonia, meningitis, abscess, etc.). If the patient suffers from obstructive bronchitis or asthma have some time, and it set the diagnosis by doctors, then you first need to use a special bulb with a bronchodilator, such as salbutamol. They relieve bronchial spasm and increase the flow of air into the lungs. Usually, 1-2 doses (inhalations) is enough for the relief of asthma attack. You cannot make more than 2 consecutive inhalations — «injection», you must observe at least 20-minute intervals. More frequent use of inhaler does not enhance its therapeutic effect, but the emergence of side effects, such as heart rate, blood pressure changes — yes. Do not exceed the maximum daily dose inhaler by an intermittent application during the day — this is 6-8 times per day. Disorderly, frequent use of the inhaler during prolonged asthma attacks is dangerous. Shortness of breath may go into the so-called status asthmatics, which is difficult to stop, even in the intensive care unit. If, after repeated use (i.e. 2 x 2 injections) inhaler shortness of breath persists or even increases — immediately call an ambulance. Recommendations for an acute attack of breathlessness or shortness of breath caused by other reasons. The basic rule: do not give yourself any drugs, as this may damage the ill, immediately call an ambulance. An acute attack of shortness of breath is a sign. What can be done before the arrival of emergency? Provide fresh cool air to the patient: to open the window or the window (air conditioning is not suitable! ), Remove tight clothing. What happens next depends on the cause of shortness of breath. A person with diabetes, it is necessary to measure blood glucose meter. At high levels of sugar shown insulin, but it is the prerogative of doctors. A person with heart disease, it is desirable to measure blood pressure (which can be high) seat. Laying on the bed is not necessary since this breathing becomes heavier. Foot drop down to the extra volume of the liquid portion of blood from the heart to the left foot. At high pressure (over 20 mm.rt. Art. Above normal), if a person suffers from hypertension, and the house has long been the drug of the pressure, it is possible to take the drug, previously issued by the doctor for relief of hypertensive crises, such as the hood or Corinfar. Remember, if a person became ill for the first time — on their own do not give any drugs. Still it is necessary to say a few words about the laryngospasm. If laryngeal spasm is characterized by a kind of noisy breathing (stridor) heard at a distance, and often accompanied by harsh «barking» a cough. Such a condition often occurs when SARS, especially in children. Its origin is due to severe swelling of the larynx during inflammation. In this case, it is not necessary to wrap the throat warm compresses (this may enhance edema). We must try to calm the child, give him a drink (swallowing alleviate swelling), to ensure access of moist cool air. With the aim of distracting can be on their feet yellow card. In mild cases, this may be enough, but you need to call an ambulance because laryngospasm may intensify and completely block the airway. The emergence and gradual strengthening of dyspnea are most common in lung or heart disease. Usually, rapid breathing, and feeling short of breath, at first, appears during physical exertion. Gradually work that people can do or the distance that he can pass is reduced. Changes comfort of physical activity, reduced quality of life. Join symptoms such as palpitations, weakness, paleness, or blueness of the skin (especially the legs) are possible swelling and pain in the chest. They are connected with the fact that the lungs or the heart have become hard to do their job. If no action is taken, shortness of breath begins to disturb the slightest effort and rest. To cure the chronic shortness of breath without treating the disease, which caused it to be impossible. Therefore, it is necessary to seek medical help and surveyed. In addition, to these causes of dyspnea appears with anemia, a blood disease, rheumatic diseases, cirrhosis of the liver, etc. Regularly taking medications prescribed by the doctor. Consult with a doctor what medicines and what dose can be taken on their own in case of emergency and keep these drugs in their home medicine cabinet. A daily walk in the fresh air in comfort mode, it is desirable for at least half an hour. Do not overeat, it is better to eat small meals more often. A rich meal increases shortness of breath or provokes its appearance. With allergies, asthma, try to avoid contact with substances that cause asthma attacks (dust, flowers, animals, pungent smells and so forth.). Monitor the level of blood pressure in diabetes — blood sugar. Liquids should be consumed in moderation, limit salt. At heart, kidney disease, cirrhosis, drinking plenty of fluids and salt retains water in the body, which also causes shortness of breath. Every day to do exercises: specially selected exercises, and breathing exercises. Therapeutic exercise tones the body, increases the reserves of the heart and lungs. Regularly weighed. Rapid weight gain 1.5-2 kg a few days signals the fluid retention in the body and a harbinger of breathlessness. These recommendations will be useful in any disease.